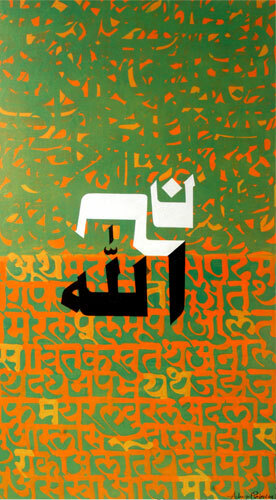 Achyut Palav is one of India's leading calligraphists with a rich body of work to his credit. He is also the founder of the Achyut Palav School of Calligraphy, recognized as a big contribution to the art community and aspiring artists in India. Q: What influences your style of Calligraphy? A: My Calligraphy is influenced by many things… songs, words of a poem, the nature around us. There is no single inspiration. Calligraphy is an all pervasive art. The styles & strokes are primarily influenced by the meaning of words. My own thoughts & perceptions guide my calligraphy. 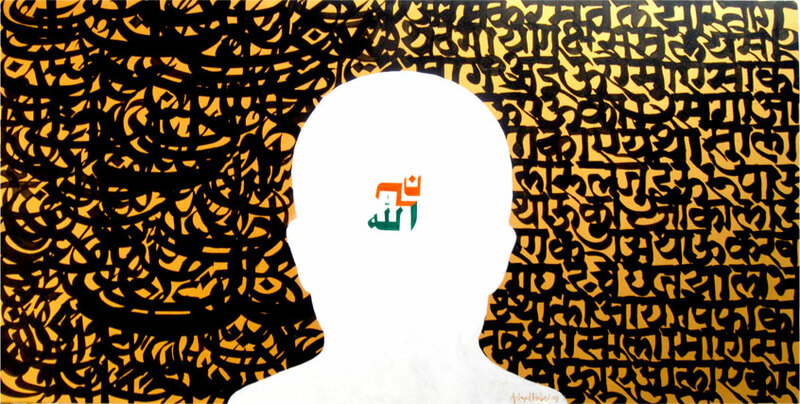 Q: What are the different cultural nuances, which reflect in Calligraphy across the globe? 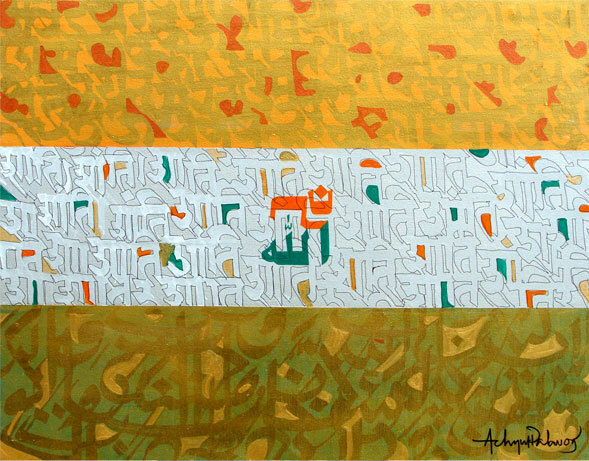 A: Calligraphy like any art is influenced by the country / place of its origin, the dominant religion & the styles of the prevalent scripts. The art of the era also influences calligraphy. The scripts in India are very phonetically rich & have a wonderful combination of straight lines & lucid curves. Therefore Indian scripts can be exploited on various mediums & surfaces. The Russian scripts are straighter. Though Japanese & Chinese have a rich heritage of Calligraphy, the recent times has seen a lot of digitization of fonts. You see a lot of gothic influence in Roman scripts making them more ornate. Q: What were your observations on Calligraphy styles in your recent visit to China? A: Chinese have a great legacy in the field of Calligraphy. Efforts are being taken to preserve this tradition. Calligraphy is a subject of research & taught to children since an young age. But with the advent of technology there has been a lot of digitization. Computer has a lot of influence on the current calligraphy, typography. There are about 4500 + characters & one has to rely on the character dictionary from time to time. But china has given some beautiful creations in calligraphy to the world. Q: What are some of your favourite tools/mediums while doing calligraphy? A: The all time favourite will be the traditional nibs & the Boru. But I feel that you think better & create better when you are experimenting. I try to go beyond the conventional tool box to include objects we come across in our everyday lives. 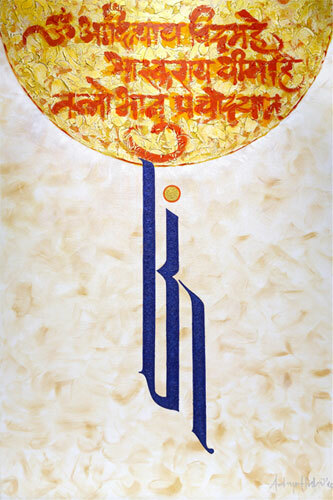 Q: What motivated you to start the Achyut Palav School of Calligraphy? A: India has a lot of potential in calligraphy. People needed to realize that calligraphy is a common man’s art & can be pursued by all. 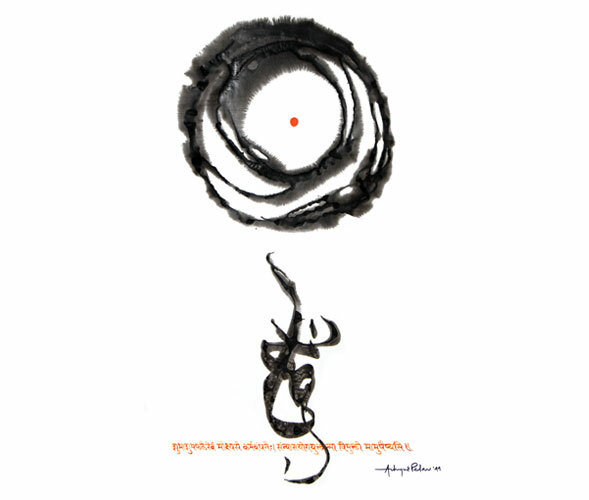 Indian calligraphy is very beautiful & unique. Indian scripts are large in number & phonetically rich & it was a need of time to put Indian calligraphy on the global art map & give it the place of honour it deserves. Thus with the aim of creating awareness & promoting calligraphy among people, Achyut Palav School of Calligraphy was formed. Q: How would you define your style of Calligraphy? A: My style is free as it comes from my heart. I believe in the understanding the meaning behind words before turning them into calligraphy. I also am still a student who believes in constant learning & reinventing my work. Therefore, I cannot restrict myself to one category. Q: Can you tell us a little bit about your upcoming projects? A: There are many initiatives planned for my mission, ‘Taking Calligrahy to People’. Under my mission there is Urja the Calligraphy Movement & Achyut Palav School of Calligraphy, both which aim at promoting Indian calligraphy. We have workshops of various levels & themes, with experts. Most importantly we are organizing Callifest’ 14. This event will showcase the works of upcoming artists & attempt to unite people under the banner of calligraphy. Q: What are some of the challenges you have faced while working on projects? A: People are still not aware of the great potential that we have for calligraphy. Art in general has less patrons & funds directed towards the upliftment & conversation of art is very low. I wish that we had broader minds when it comes to art. The scenario is changing but we still have a long way to go. Q: Any tips for new calligraphy artists on how to develop their own style? A: Each Person is different & therefore capable of developing his / her own style. A single thought can yield 2 different creations from 2 different persons. But in my opinion one must reinvent himself from time to time. Also one must be very strong in the basics. The construction of a letter (in calligraphy, each letter, each character & each symbol is a design), its proportion alignment etc must be keenly studied to develop a good eye. A style is created or developed only when you have strong basics. 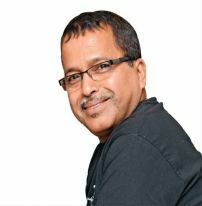 Q: Could you elaborate on how you work on a project – from conceptualization to execution? A: When a particular task or project is thought about or I am approached for one, the initial work is in understanding its purpose. Eg The logo ‘Signature’ created involved a lot of study of the clients need & idea, its USP, Readibility, Recall Value, Style to be used or created, Target Audience etc. This is the exercise that needs to be followed always. But when you are doing a painting or an exhibition one must decide on the subject. Sometimes its pre-meditated while sometimes a spontaneous. The central idea can be spiritual or inspired by an element of nature or simple some poems, it needs to be well researched. Understand the meaning of words & the mental images they create. Ponder upon them & calligraphy will slowly come to you.